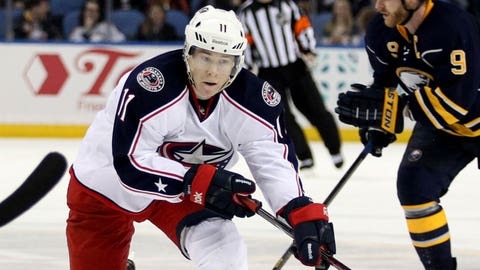 The Blue Jackets' Matt Calvert is ready to play pivotal hockey. "Definitely, every point matters for every team right now. A lot of teams now are playing for their playoff lives, fighting for a place in their division or conference, and just trying to better themselves going into the post-season. We want to get to the playoffs; we’re hungry, and we’re going to keep bringing it night in and night out." Columbus Blue Jackets winger Matt Calvert was talking about the ever-increasing intensity of games heading down the stretch of the NHL regular season. His team has definitely been bringing it "night in and night out." Unfortunately, in the game against Carolina Tuesday, the hard work wasn’t enough, largely because of the work of Hurricanes goalie Anton Khudobin. But, that disappointing loss aside, Calvert says the Blue Jackets have to stick to their identity of hard work and physicality. "I think that’s a strength of our team. We are a big team, and we’re a strong team, and we need to play to our strengths," he explained. "A big thing for us down low is winning those one-on-one battles. That’s where a lot of our offense is created, in the corners, puck races, then getting the puck to the net after that. Those are important things that the coach preaches, and we’ve got to stick with it." It’s the second season in a row that the Blue Jackets have moved themselves into the heat of a frantic push to the playoffs. For a young player like the 24-year-old Calvert, now in his fourth season in Columbus, it’s a welcome move forward for the franchise. "It’s great. In seasons past, we haven’t been playing meaningful games this late in the season," he said. "And it’s tough to get up for hockey games. You ultimately want to win the Stanley Cup – that’s your goal every year, and in order to do that, you have to get in the playoffs. "That’s a big part of the battle, and then once you’re there, you kind of decide your fate as a team," Calvert continued. "It’s a lot of fun playing these games. You have a lot to play for, and individually, as a player, you want to get to the playoffs, too. You get a chance to showcase yourself, and you get the chance of being a champion, so it’s real exciting for me." As the games ramp up in intensity this time of the season, it’s intriguing to see how players respond. Some players are able to ride the increased pressure to a new level in their own games. Calvert thinks it’s a fine line players must skate, if you will, to maximize their games during a playoff push. "To a certain extent, you try to stay within yourself," he mentioned. "But you obviously have to bring it up a level, too. If you watch playoff hockey, it’s fast, and guys are working their butts off. It’s a different bird, that’s for sure. I think for us, we have to bring that next level. We need to be better than each team every night, and just go out there and have fun and play our game." It’s no secret the Blue Jackets have one of the most demanding schedules for the remainder of the regular season, including eight games over the final 12 days, counting the rescheduled game in Dallas. That’s nothing new for this team, which pushed right to the brink of the playoffs during last season’s lockout-compressed schedule. "It kind of reminds me of last year," Calvert agreed. "It seemed like we played every second night last year, and it’s a very similar schedule since we’ve been back from the Olympic break. You kind of get in a bit of a groove. It’s tough mentally and tough physically, but you just keep on going. "You rely on adrenaline, and I think a real important thing for our team is we’re four lines deep, three D-pairings deep, and two goalies deep," he continued. "That’s a big thing for us. We can roll four lines all night, and we seem to wear teams down. That seems to be the case this time of the year: teams are rolling three lines and sometimes two lines most of the night, and they’re getting tired. I think that’s when we have to take over, in the third period." With 14 games overall in the next 24 days, that depth and balance will be tested severely. It will be a three-week blur for the players, a true survival-of-the-fittest challenge. Pass the adrenaline.